In July, the countries declared the war was over; a couple of months later, they opened their border for the first time in almost 20 years. Some analysts caution big changes are coming too quickly. People walk on a road that leads from Ethiopia into Eritrea. The two countries' border was opened in September, the first time in nearly 20 years. 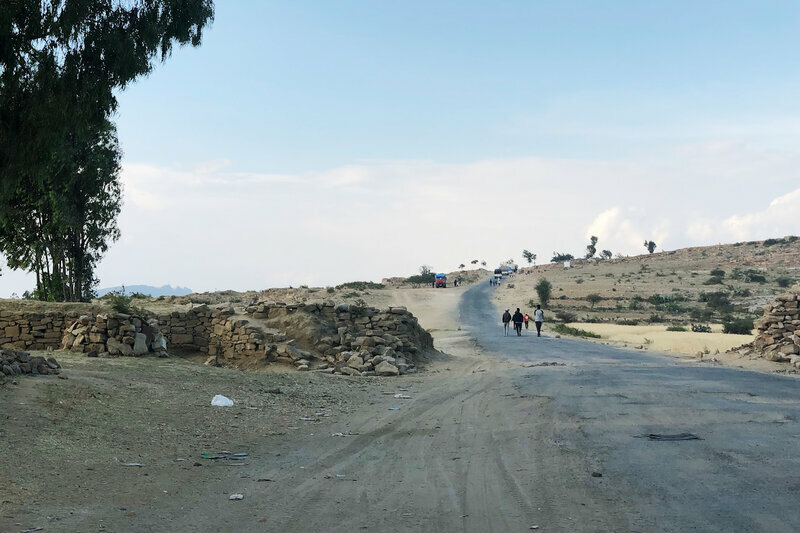 Almost everywhere you go in Zalambessa, a town on Ethiopia's border with Eritrea, there are reminders of war: buildings in rubble, walls riddled with bullet holes and a border still delineated by two rows of trenches. But now, dramatic change is underway. Many of the troops have pulled out. A little cafe has popped up right on the border. Children are selling candies and drinks to travelers and, for the first time in two decades, people and goods are transiting the crossing between Zalambessa and the Eritrean town of Serha. Tesfagabir, a man in his 40s, runs a horse-drawn cart taxi back and forth over the border. Like others interviewed in this story, he would give only his first name because he still fears the Ethiopian government. He says every time he crosses the border, it feels like a dream. "Peace is everything," he says. This war never made sense to him. "We have children from them and they have children from us," he says. "We are connected by blood." Ethiopia and Eritrea were once a single country. Eritrea gained independence amicably from Ethiopia in 1993, but a few years later, the countries went on to wage one of Africa's deadliest wars. 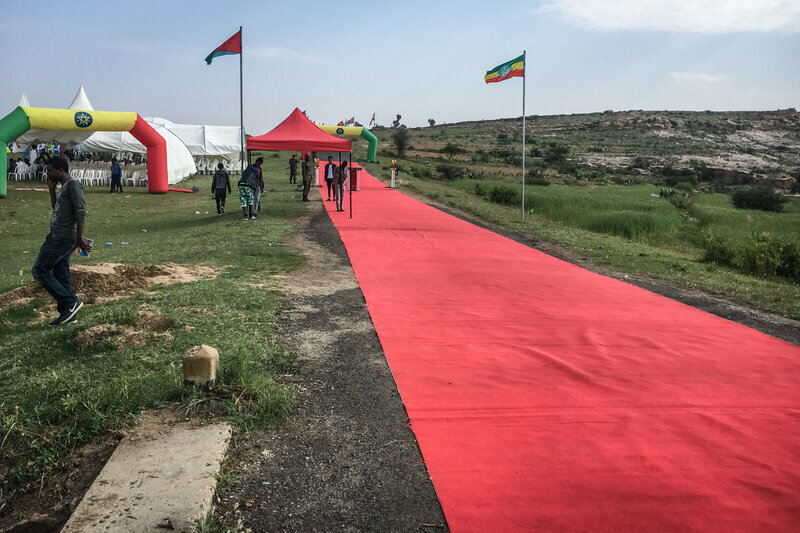 A red carpet was placed to welcome Eritreans to Ethiopia as two land border crossings between the countries were reopened in September, in Zalambessa, Ethiopia. Then this past July, amid a whirlwind of political change in Ethiopia, the two countries declared an official end to the war. In September, the Serha-Zalambessa crossing was opened for the first time in almost 20 years. Once that happened, one of the first things that 47-year-old Mezgebo did was return to his family home. Until the opening in September, he could not have even stepped here because his family home was built right between the two trenches separating Serha and Zalambessa. Unfortunately, when he got home, all he found was a pile of rocks. The house had probably been destroyed by a tank or a bomb. Mezgebo, 47, found only a pile of rocks when he returned to his family home. But he began work anyway, winnowing his wheat within view of the Eritrean border. 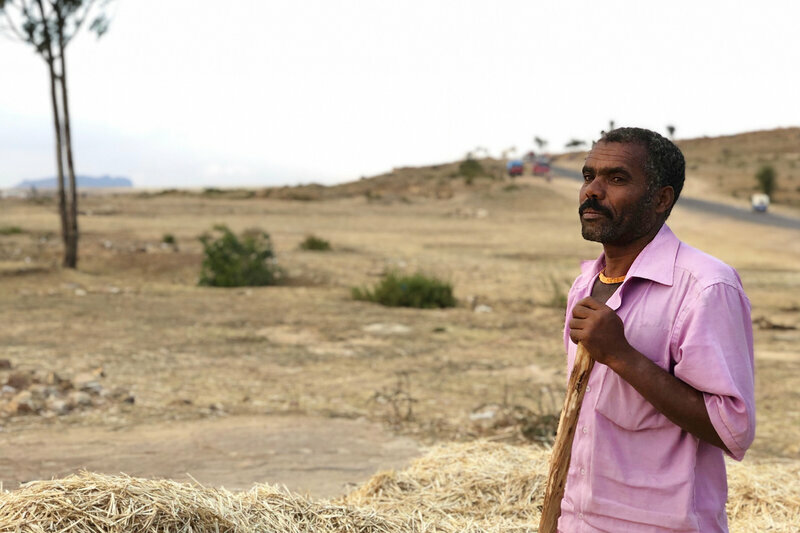 He got to work anyway, winnowing his wheat right next to the rubble, within view of Eritrean soldiers, trying to bring the place back to life. When the war started, lots of villagers here disappeared � taken by an enemy army, Mezgebo says. He hasn't seen his brother in decades. Since the violence ended and the border reopened, lots of people have returned, he says. But he doesn't expect to see his brother again. "I don't feel hope that I will see him," he says. What he wants is for Ethiopia and Eritrea to have the courage to tell him what he knows in his heart � that his brother is dead. Ethiopia and Eritrea go way back. Ethiopia's emperor signed away the territory to the Italians at the end of the 19th century in exchange for financial assistance and military supplies. After World War II, following the defeat of the Axis, Eritrea became part of Ethiopia again. In the 1990s, Eritrean separatists helped Ethiopian rebels topple the communist government and, in return, the party now governing Ethiopia allowed Eritreans to vote in an independence referendum. Voters chose overwhelmingly to secede. But it wasn't long before brothers in arms turned on each other. Border skirmishes escalated into full-on war by 1998. An estimated 80,000 people were killed. An agreement in 2000 ended the heavy fighting, but border disputes continued for years, with the two countries acting like estranged siblings fighting a cold war. 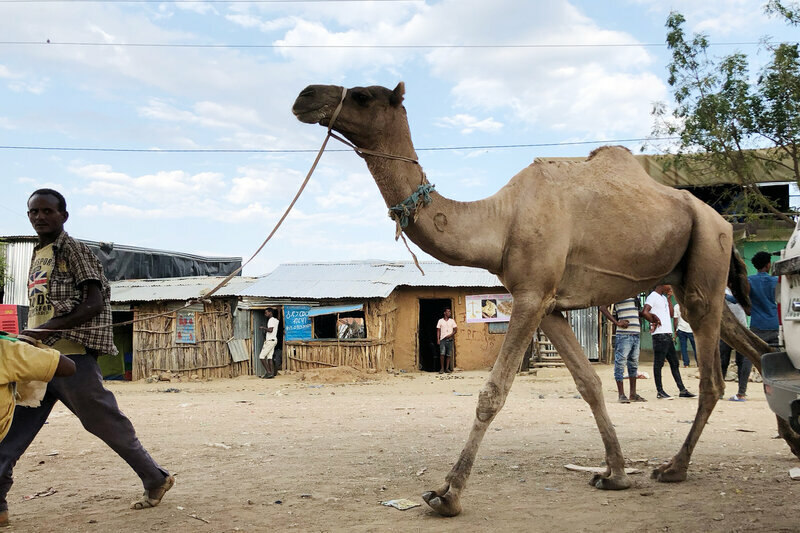 This year, Ethiopia has gone through some earth-shattering changes. After almost three years of popular protests that paralyzed the country, the ruling party unexpectedly installed a reformist prime minister, Abiy Ahmed, in April. One of the first things Ahmed did was fly to the Eritrean capital of Asmara; he shook hands with President Isaias Afwerki, and peace began to blossom. Cross-border phone calls and air routes, which were cut off during the conflict, are back on again. Borders that had been guarded by armed troops suddenly reopened. Families reunited and Eritrea agreed to allow landlocked Ethiopia to begin using and developing Eritrea's Red Sea ports. Daniel Berhane, an Ethiopian political analyst, says the history between the countries runs too deep for changes like these to be made so quickly. "When you go to the details [of this peace], they are poorly managed," he says. "They are not properly planned and designed, so most of them end up being messy." For example, there are hardly any regulations around tariffs, border controls or currencies (Ethiopia uses the birr and Eritrea uses the nakfa). Truckloads of cargo and people are crossing the border by the thousands per day but few rules control them. The last time these two countries fought, Berhane says, it was over these exact issues. Today, there are even stronger points of friction: Ethiopia is moving toward a more democratic system. But Eritrea, which is known as the hermit kingdom of Africa, seems immovable. What happens, Berhane muses, if Ethiopia's neighbors are inspired by its newfound freedoms and a popular protest movement swells in Eritrea too? Would Afwerki blame Ethiopia? "All these things could potentially explode, we never know," he says. "We are in a crossroads." One reason peace took hold quickly is that Ethiopia's new leader publicly accepted the 2000 deal to end hostilities. That included a key decision made by a United Nations boundary commission: Badme, a small town bitterly fought over by both sides during the war, would go to Eritrea. The concession seemingly put to rest one of the thorniest issues between the two countries. But months after Abiy accepted the deal, little has changed in Badme, a dusty town almost 200 miles west of Zalambessa. So far, Eritrea has not gained control over Badme, and many of the town's residents believe that Abiy did not mean what he said. They are convinced the town will in the future become a kind of borderless middle ground � definitely not under the rule of Eritrea. Habtom Mesay, 26, sits at a bar in center of Badme, watching Ethiopian military trucks rumble by. 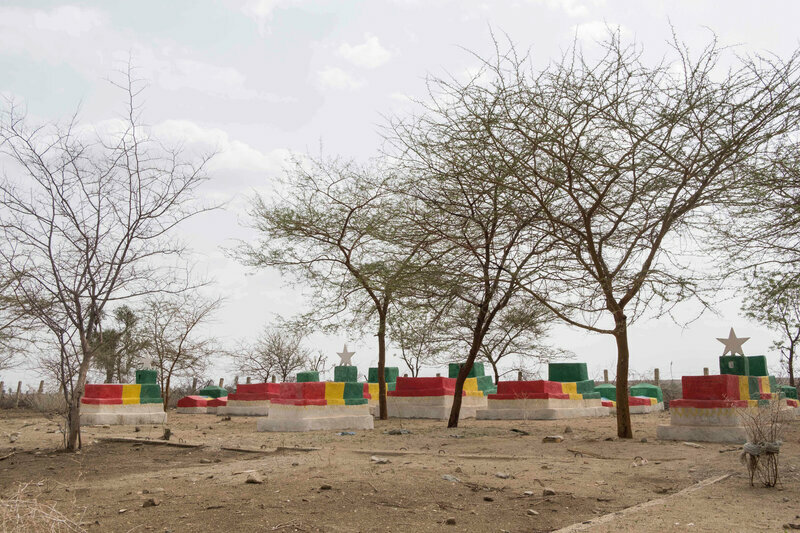 Graves of Ethiopian soldiers who died during the battle against Eritrea are painted in the colors of the Ethiopian flag in Badme, a town the Ethiopian leader has agreed to hand over to neighboring Eritrea. He was a young boy when the war started and he remembers watching authorities deport his Eritrean friends and accuse them of being the enemy. They were some of the tens of thousands of Eritreans expelled by Ethiopia near the start of the war. "We have [known] each other for years. We have married; we have blood relations. We know each other better than anyone," he says. In a lot of ways, he adds, this war was always driven by two governments, and if the governments just allowed the villagers to settle their own disputes, peace would prevail. Everyone knows what land belongs to whom, he says. The problem will come if the governments begin redrawing borders. "If they start drawing lines, the war will return," he says. In Badme, there are few resources or facilities that one might consider of value. Camels wander the brown land and goats feed off acacia trees. Recently, however, small prospectors discovered some gold, so hordes of young men come in and out of town to try their luck. The village of Badme has been at the center of this conflict for decades. There are few resources here to fight over, which is why the conflict was often described as one between two bald men fighting over a comb. When the border war raged, hundreds of thousands of troops crowded this terrain, part of a conflict that was often described as one between two bald men fighting over a comb because so little was at stake. But the war had very real effects. Shishay and Mihret, two siblings in their 30s, say they had not seen each other since the war started. Mihret married an Eritrean man, and the last time she saw her brother, he was a little boy. Shishay stayed in Badme and Mihret moved to a tiny village just across the front lines into Eritrea. A day earlier, she had traveled to Badme for the first time in about two decades. Eritrean authorities warned her not to travel because the road had not been cleared of land mines. "But my heart led me here, anyway," she says. Sometimes, during their 20 years of separation, Shishay says, he would walk to the edge of town, right before the militarized border, and stare at the open field, imagining the life his sister was having just a few miles away. "We were missing each other very much," he says. "If missing could kill, we would be dead." A neighbor they did not know invited them to sit in the shade and have coffee. The neighbor burned some incense, popped some corn and looked at them with maternal tenderness. Others who had returned from Eritrea were not so lucky. They came home to locked doors, destroyed homes and news that the family they had missed for so long had perished. "I never expected that I would find her alive," Shishay says. "She missed our father because he died." But she's lucky, he says, pointing at a group of young cousins who had never met before this week, playing as if they'd known each other all their lives. Hopefully, this peace will last, they all agreed, because everyone is tired of the fighting.